Yes! You can customize the cropping of your photos before checkout. Will my prints say “Tony Alves Photo” on them? No. The logo (known as a watermark) does not appear on the finished products. Do you sell digital downloads, or license photos? 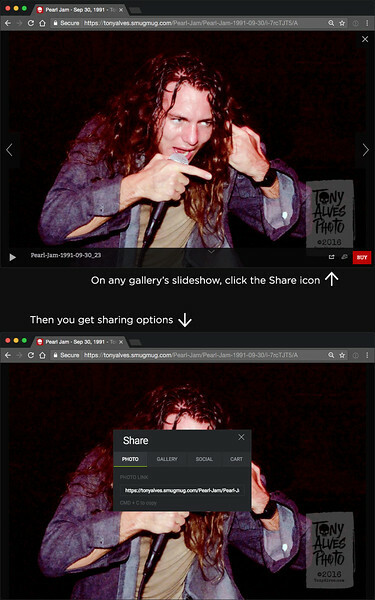 We don’t sell digital downloads but you can use the Share function to post photos almost anywhere, including Facebook, Twitter, and Google+ (see image below). If you’re a journalist or publication interested in licensing a photo for commercial purposes (in print or online), please contact us for details about licensing fees (we’re nice!). Our photos are printed by the professional photo lab BayPhoto, with a variety of papers, finishes, and mountings available. Sizes range from 4x6", 5x7", 8x10" to poster sizes like 20x30". Gifts (merchandise including greeting cards, mugs, fine art prints, canvas, buttons, wearables, etc.) are printed by professional photo printers EZPrints. We offer shipping via USPS and FedEx. Prints are shipped in sturdy flat-pack delivery envelopes. Large prints / posters are sent in sturdy shipping tubes. Gifts and other large goods are send in sturdy boxes. Yes! For a list of all countries, see this SmugMug support page. Visa, MasterCard, American Express, Discover, and PayPal. You can select your own currency in the Shopping Cart. Do I have to sign up for SmugMug to buy photos? What the heck is SmugMug anyway? It’s a pretty awesome worldwide community of photographers, established in 2002. We use their platform to power our website and shopping cart. Check out SmugMug. We have a 100% print guarantee. See Shipping & Returns. Our archive consists of thousands of images but we’re a small business and can only fix and upload a few sets per week. We’re always adding more bands and shows, so please subscribe to our email newsletter (below) so you’ll hear when we add your favorites! Can I get a signed print? Tony Alves can hand-sign a print by special request, for a nominal fee. Signed print orders will be delayed. Please email us with 1) the picture name/number, and 2) the size print you’d like to purchase. Maybe! Make us an offer. Can Tony shoot my band? Maybe! Are you in the Bay Area, or are you coming here? Email us with details.